Even before I could compose my thoughts and publish this post, I was back in El Nido, Palawan sooner than I thought. I must have fallen for the place so much that I don't mind going through long hours on rough roads to get there, not just once but twice for the past thirty days. Along with my colleagues, we were planning on a trip to Palawan, to see the Underground River after it was proclaimed as one of the 7 wonders of the world. On Christmas Day, airfare has gone on sale, for our planned trip in time for the Labor Day holidays. We hurriedly purchased a ticket with Cebu Pacific Air from Cebu to Puerto Princesa at half the price. We scouted a few travel packages but decided to do it on our own. As I was pretty much occupied with work, it finally dawned on me two weeks before the trip that I ought to make some reservations. Contrary to what is written on the net, the permit to enter the Underground River required two months prior booking. Ever since it was proclaimed as one of the 7 wonders of the world, local and foreign tourists has flocked this site. We were left with no choice but to change plans, visiting Puerto Princesa isn't worth the trip without a trip to Sabang to see the Underground River. El Nido must be the next best thing, deep inside me, it's the best thing. A trip to El Nido has been on my bucket list for the longest time. El Nido became popular because of the luxury resorts of El Nido Resorts in Miniloc Island and Lagen Island and soon to open Pangalusian Island which is frequented by affluent individuals including hollywood stars. For many years, I've equated El Nido with luxury resorts and chartered flights. Actually, this is so untrue. Anyone with meanial budget can still enjoy the beauty of El Nido. 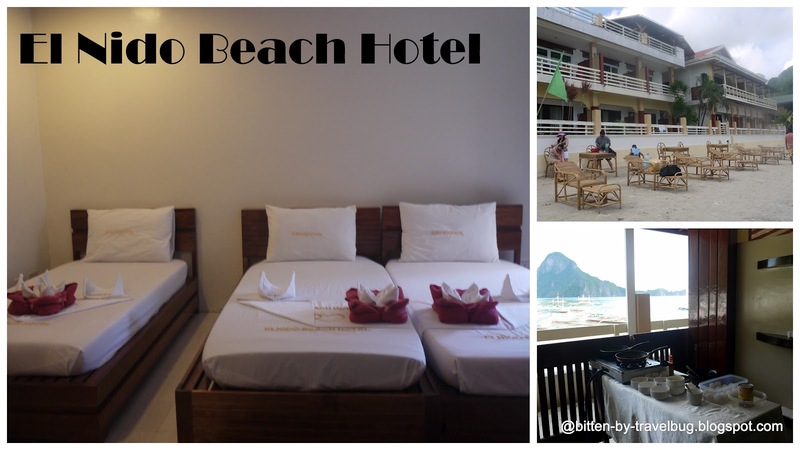 Here's how we made it to El Nido on an affordable budget without compromising comfort. We took the plane ride from Cebu to Puerto Princesa on Cebu Pacific Air. Prior to our departure, we have pre-arranged private van transfers with Lexus Shuttle to pick us up at the airport and to shuttle us all the way to El Nido. In Puerto Princesa, we stopped at Badjao Restaurant since Ka Lui (the more popular one) was full for lunch. At half past two, we started the long 5 and half hour ride to El Nido. We made two pit stops along the way. It was a relief to see that the road was already concreted four-fifth's of the way. The shortest way to get to El Nido is by chartered flights on Island Transvoyager Inc. (ITI) they fly three times a day from Manila to El Nido Town at a price of P6,700 per way. El Nido Resorts guests normally enjoy a preferential rate of about P10,000 round trip. Return flights from El Nido to Manila can only be booked through El Nido Boutique & Art Cafe. If you find the chartered flight too much like I do, Cebu Pacific Air flies direct from Manila and Cebu to Puerto Princesa, while Philippine Airlines flies only from Manila to Puerto Princesa. Also check out Zest Air. Check out their site for the latest flight schedules. From Puerto Princesa airport, one can head to San Jose Terminal, then take the public bus (8 hours) or commuter van (6 hours) to El Nido or pre-book a private shuttle van like we did. There are other shuttle provider such as Eulen Joy and Fort Wally however, Lexus Shuttle has better reviews online. Do visit http://www.lakas.com.ph/ for more information, he did a very comprehensive post about it. Since there were six of us and traveling with kids, we pre-booked a private shuttle van with Lexus Shuttle for P6,000 per way, others charge P7,000. It was worth the premium compared to taking the public van for P750/head or bus at P500/head. It can get cramped on the van, with four people sitting in a row. The van was clean and fairly new and the driver drives safely. If you wish to book with them, simply give them a call with the above mobile phone numbers, payment will be made at your destination. On a separate occasion, I had to arrange through a travel agency since we were a big group arriving in different flights. About 30+ of us, are travelling from Puerto Princesa to Sabang (Underground River Tour) then to El Nido and back to Puerto Princesa. They charged us P1200 per pax for underground river tour plus P15,000 for roundtrip van transfers to/from El Nido on a Nissan escape while the driver stayed overnight in El Nido for 3 nights. Their vehicle was quite comfortable because it has a headrest and wide leg room. I've not personally tried their service but their executive coach and executive van looked comfortable each having a head rest. Considering the 5 hour drive to El Nido, a little premium for comfort is worth the price. The only drawback is they only have one unit each available for now. 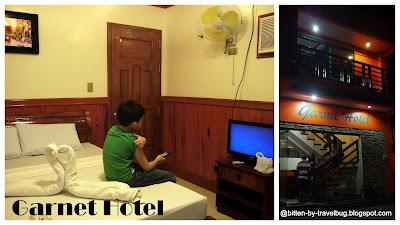 We stayed for a night at Garnet Hotel that we booked through Agoda.com. The hotel is new, the rooms and bathroom are spacious and clean, service was great too. It is located right in the middle of El Nido Town, although it's not beachfront, the road is too narrow that it remained a stone throw away from the beach. We can see the beach from the windows. We got the family room for P2,500 good with breakfast for 3 persons, with 1 queen bed and 1 single bed. On the other hand, the deluxe room at P1,800 comes with 1 queen bed and breakfast for 2. The rooms comes with aircon, lcd tv, towels, basic toiletries and free wifi. Electricity is available only between 2pm to 6am, like the rest of the town. The hotel is still finishing up the rest of the floors and is expected to be in full operations by 2013 and plans to have their own generator for 24 hour power. (update 2013: the hotel now has a generator running during the day, enough for lights and hot water) The hotel looked vibrant in orange, probably one of the very few modern buildings in town, a standout amongst its neighbors that looked very rustic. Complimentary breakfast was served across the street at Habibi Restaurant with a spectacular view of El Nido Town beachfront. During our checkout, we met the owner who was gracious enough to offer a ride on his brand new Kia Picanto when it was raining. El Nido Beach Resort is beachfront on one side of El Nido Town. Since rooms were not available on agoda on our preferred dates, I had to call them to make reservations, however the front desk entertains only email communications for reservations and does not guarantee your booking unless you do money transfers through M Lhuillier or Palawan Pawnshop or through their korean bank account. We got the cheapest room at P3,000 with buffet breakfast and three single beds but without the seaview. At first glance, we felt it wasn't worth the premium compared to Garnet Hotel unless you upgrade to the seaview room. At the end of the day, I appreciated the incredibly sound proof room that kept me sound asleep inspite of the noise on the road outside. Electricity is available only between 2pm to 6am like the rest of the town. Marina Garden Beachfront Inn is located in the middle of El Nido Town on the beachfront, they probably have the widest frontage. They have quite modest rooms, country villas are newer and airconditioned while native cottages are rustic and fan cooled. We opted for standard rooms of the country villa since these looked more modern, cleaner and fairly new. The best thing about them is, there is no payment required to reserve a room. Electricity is available only between 2pm to 6am like the rest of the town. COUNTRY VILLA (airconditioned, with free breakfast)Maximum capacity: 4 adults. Recommended capacity: 2 to 3 adults. El Nido Town may have a stretch of white sand beach, but it is not ideal for swimming. Quite a number of outrigger boats dock on the shore and noticeably waste water is thrown into the sea in some areas. Island Hopping is definitely a must. Tourists need not worry how to book a tour. As soon as you get into town, there are quite a number of stalls offering tours and these stalls offers fairly the same program. For us, we opted to book through the hotel, I would assume, the hotel knows the service provider better. Booking through the hotel offer pretty much the same service and rate and they will take care of logistics and the bill is usually charged to the room whether it is a private tour or not. The most common tours being offered are tagged as Tour A, B, C and D. If there is anything you should not miss, is Big Lagoon and the Small Lagoon which is part of Tour A. Tour A is best, then tour C, then tour B. The tour normally comes with lunch which your boatman will prepare and cook on one of your stops. If you want to own your time, itinerary and some space on the boat, you may opt to hire a private boat like we did otherwise, you may opt to join scheduled departures with other tourists, at 9 in the morning and ends by 4 to 5 in the afternoon. The best time to visit El Nido is during the height of summer, between February to May when the sea is calm and less chances of rain. El Nido is famous for its lovely landscape of the numerous karst around, unspoiled marine life, sunny days and white sand beaches. Altogether, El Nido island hopping experience deserves a separate post. Here's my tips on the best island hopping tour in El Nido. This is probably my favorite place to hangout in El Nido Town. 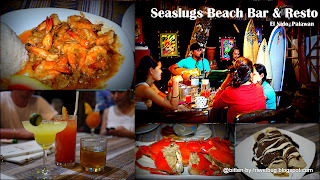 It is located on the beachfront, at night, tables are set up by the beach. They serve great seafood at reasonable prices. Crabs were billed at 350/order (for 3 pcs medium sized)! Drinks such as the margarita and daquiri were good as well. They have great singers that play good music all night long. If you opt for a more quiet escape, go dine at El Nido Corner Beach Restaurant. 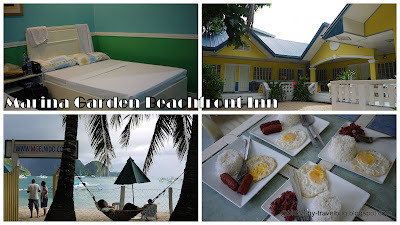 Located on a more quite part on one end of the beachfront of El Nido Town. The candle light setup sets the mood. They serve great seafood, do order the prawns in lemon butter sauce. The pizza (filipino style), chicken curry and crepe was also good. It takes a while for food to be served, come when you can leisurely wait. Otherwise head to Sea Slugs. Their specialty is the banana heart curry. It was great but i'm not a fan. On its menu, you practically have the option to say how you want your food cooked. The restaurant is on the 2nd floor on the sea side, the view is best enjoyed during day time. We had breakfast in this restaurant (complimentary from Garnet Hotel).. The food was average but who would complain when you can sip a cup of coffee with a view of the beach and limestone cliffs (karst). It is more popular for its Sisha at night. This restaurant serves brick-oven baked pizza, owned and operated by a Slovinian national for the past 8 months. One has to go up barefoot on the 2nd floor where ambiance is great and food was particularly good. Order the pasta with fungi (mushroom), any flavor of the pizza, and the gelato ice cream was also great. Food choices was limited. Taste wise, Nothing great, nothing bad, just average. Being one of the first decent restaurants in town, it has remained as an icon. An interesting cozy restaurant (not on the seaside) owned by a French guy. We didn't get to try this but they also got good reviews online. Now, you have enough information to experience El Nido like we did. Go! Very informative! Im booking for a barkada getaway now. Thanks! Wow! Galing ha! This is the first time I hear about a transport company like Daytripper in the Philippines. Cool name too ;) I hope they are still around by next year when my barkada and I are planning for El Nido.